Get your hard drives destroyed, protecting your data. 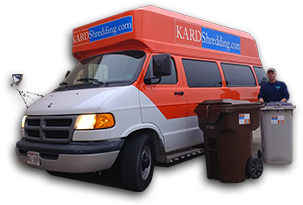 KARD Shredding, serving both businesses and residences in the greater Milwaukee area, has been locally trusted since 1975. Specializing in paper and media destruction, KARD Shredding ethically destructs and disposes of materials in an ethical fashion, recycling the majority of waste. KARD Shredding has secure trucks ready to pick-up materials from your business or home, and there's also a walk-in special on Tuesdays and Wednesdays from 8-4 offering up to 500 lbs of shredding for just $15. KARD Shredding is ready to greet you with a smile and a promise of satisfaction. We look forward to working with you! From 8am to 4pm on Tuesdays and Wednesdays, we shred up to 500 lbs for just $15 and 10 cents/pound over 500 lbs. This is for Walk-In customers only at our New Berlin location. Copyright © KARD Recycling Service Inc. All rights reserved.